Mastering the art of baking is something that can take years to achieve — if ever. It’s become one of my goals in retirement. Cooking has always come easy for me, whether it’s making soups, casseroles or main-course entrees such as a Thanksgiving turkey or an Easter ham. But I never baked much until the past couple of years, despite having a basic knowledge about how to go about it from years of watching Mom and later Therese. My admiration for good bakers is the highest. My mom and her and her mom were among the best. I can remember sampling many of Grandma’s Menard’s homemade goodies, such as her rolled sugar cookies and her rhubarb cake, as a little boy. And I enjoyed those of my mom, including her cookies, candy, cakes, pies and bars, well into my adult life. Mom was still baking up a storm right up until she died unexpectedly in her mid-80s. My first foray into baking was making apple crisp with a recipe (here) that was given to me by a former co-worker at the Herald, Marsha Gunderson. After that, Mom taught me a bit about making Christmas cookies and other holiday goodies, which I’ve continued to do on a limited basis ever since. 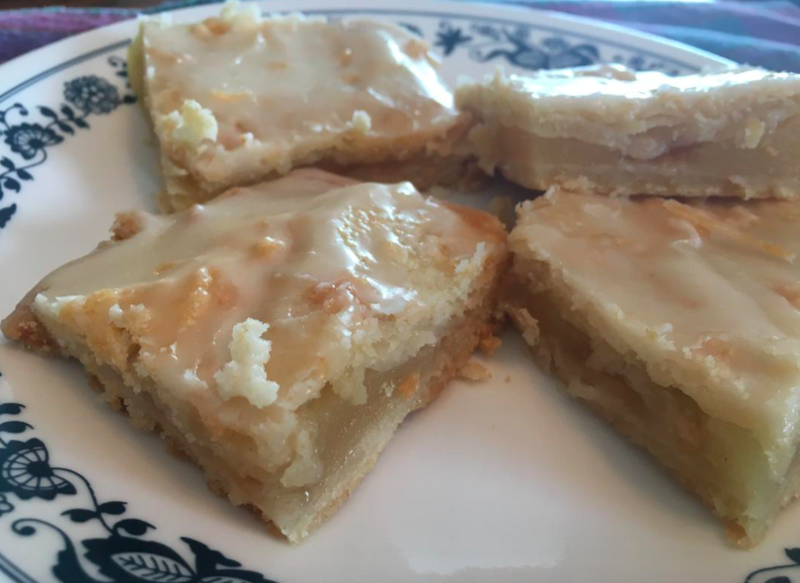 Lately, while going through her recipes, I came across one for apple bars, which were a favorite of mine in my youth. Therese and I recently gave the recipe a try, and it was a piece of cake. Or should I say bars. Put flour, salt and sugar in mixing bowl. Using a pastry cutter or two knives, cut shortening into flour. Blend in 1 beaten egg yolk with milk, saving egg white. Roll out on a flat surface. Take half of dough and place in a jelly roll pan. Cover with apple pie filling. Dot with butter. Roll other half of dough and put on top. Beat egg white until stiff and put on top. Bake at 350 degrees for 35 minutes. Frost while hot with powder sugar frosting. Beat the confectioners’ sugar, butter and milk in a medium bowl with an electric mixer until mixture is light and fluffy. Beat in and vanilla. Use more milk until you reach desired consistency.